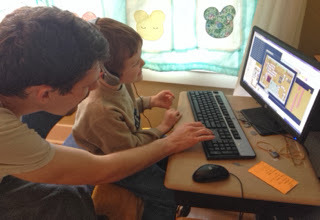 Little Mister has zoomed through his math lessons this fall, so instead of moving him ahead to fourth grade math (he is only a first grader, after all) we decided to try some supplemental computer coding for a while. Hubby found an open-source game building program that uses the Legend of Zelda as it's base. It has a visualizer, so he can immediately see the relationship between the code he writes and the way it will appear on the screen. Of course, he loves it! He spent most of the day yesterday on it, and joyfully chattered to us about the choices he made for his imaginary world.